So the sabbatical I’ve been taking from seeing live music for the past few weeks has evidently done me a world of good because not only was my narcolepsy under control before heading into Saturday night’s triple-bill at the El Mocambo, but I was actually eager to get out and see some bands play. And the lineup that was going to ease me back into things was a varied one. You had the headliners – Syracuse’s Ra Ra Riot – whom I covered last week, Toronto’s own The Coast, whom I’ve covered many times before, and from New York City The Virgins – whom I’d never heard of before this show. But just because they were a blank slate to me, it was obvious right away that they weren’t unknowns as the front of the stage was packed with showgoers ignoring the proud Toronto tradition of standing at least 10 feet back during opening acts. 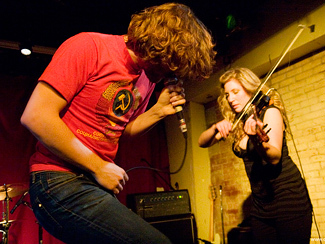 And when the four piece got started, they broke another hallowed Toronto custom – and danced. Which is good, because it was pretty obvious that The Virgins’ manifesto is to get the pretty girls to dance, and there’s nothing wrong with that. With an air of insousciant cool that was pure NYC, the played a sort of post-Strokes-y, Velvets-y guitar rock with a healthy dose of groove that got the crowd moving early and when their half-hour set wrapped up with the unabashed disco of “Rich Girls”, the crowd up front either dispersed to other partying venues or swarmed the band for photos and autographs (and then dispersed to other partying venues). Apparently these guys already have quite the following. And with that crowd cleared out, an almost completely new one swarmed the front of the stage for local boys The Coast. They’d been relatively quiet during the latter part of 2007 what with working on their debut full-length but with that in the can and set for release on April 1 (Expatriate – ask for it by name), the band is looking to deliver on the promise of their self-titled EP from a couple years ago and if this performance was any bellwether, they’re ready. I’d seen them a number of times before but not in over a year and in that time, they’ve certainly grown as a band. Actually, in the past their perfectly show suited the sustained, melancholic mood of the EP but as the new material – of which the set almost completely consisted of – is more diverse and energetic, it makes sense that the band’s performance would follow… or maybe it’s the other way around. Whatever the case, they impressed me all over again and I’ll happily join the chorus of those calling for 2008 to be a breakout year for The Coast. When The Coast were done, the front of the stage once again cleared out – I’ve never seen a turnover like that at a show before – but was pretty much full when the headliners came out, which is good because it’d have been a bit awkward otherwise (“yeah, the mostly full house? Not here to see you. Sorry”) and for those of us lucky enough to be up front, we got a faceful one of the most energetic live shows I’ve seen in recent memory (and that’s not just relative to the very few shows I’ve seen lately). Usually when someone says a band is really high-energy, they mean that there’s one or two extroverts who’re the centre of attention while the rest of the band sits back, does their thing and ponders the cold cuts awaiting them backstage. Not so, Ra Ra Riot. With them, everyone is a dervish onstage, dancing and playing and just exhibiting such pure joy at being up there and playing music with each other (okay, drummer Cameron Wisch is kind of anchored but you know that if he could, he’d be all over the place as well). It really was something to see. Led by the hyper-animated Wesley Miles on vocals and occasional keys, the band tore through most everything on their self-titled EP as well as a smattering of new material, though not as much as I’d expected considering that their debut full-length is already done, and a Kate Bush cover they’d done at their Daytrotter session last year. As a result, their set was over in a lightning-quick 35 minutes – far too short for as much fun as I was having – but given the response they got, when the album drops later this Spring, I’m sure they’ll be back. Thanks to Jack in the comments for pointing out the other day that No Rock & Roll Fun had themselves a Ride weekend, searching out and embedding various YouTube clips from the band – live and promo – and generally waxing nostalgic. Oh, Ride, why do you have to be so noble? Just cash in and do the reunion for the money. And do it in London sometime between May 20 and 24 of this year. And save me a ticket. Pitchfork reports that Mogwai will celebrate the tenth anniversary of their debut Young Team with a deluxe reissue set sometime in April, complete with requisite remastering, liner notes and bonus tracks. Hey, maybe the 43-minute version of “Mogwai Fear Satan” will finally see the light of day. Back in the present, work continues on their next album with recording slated to wrap up next month, mixing in March, a release sometime in the Summer/Fall and gobs of touring to follow. The Scotsman profiles The Twilight Sad, who wish to never be called “Highland emo” again. Drowned In Sound talks to the principles of Pin Me Down, half of whom are Russell Lissack of Bloc Party. BlogParty talks to the other half, NYC singer/guitarist Milena Mepris. How’s it sound? Like a danced-up, female-fronted Bloc Party which, at first blush, works for me. Samples at their MySpace. First single out in March. Drowned In Sound, The Scotsman and Harp converse with Dev Hynes of Lightspeed Champion, in town March 4 at the Horseshoe in a 2-piece configuration – Hynes on acoustic guitar, guy from Hope Of The States on violin. I can’t wait for Expatriate as well.